Dimensions: 35 x 28 3/8 in. (88.9 x 72.1 cm) approx. 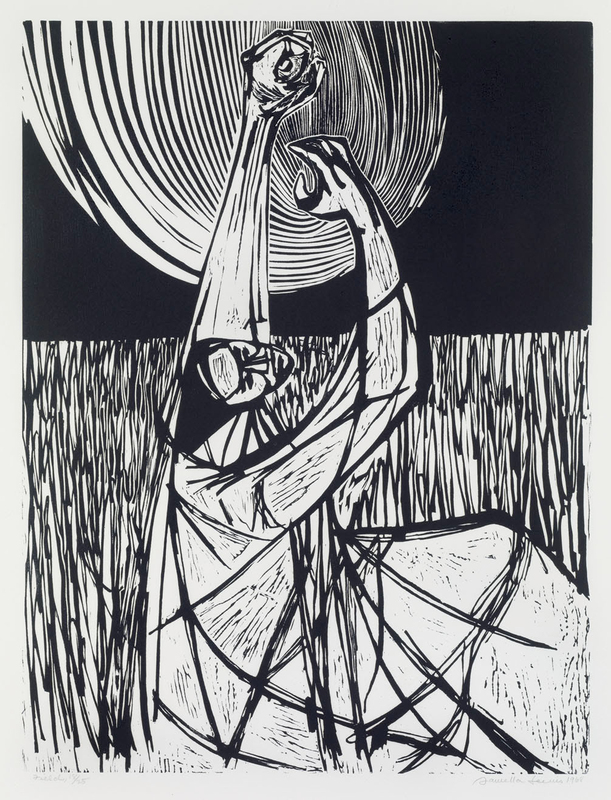 This print shows a man standing in a field, his arms raised strongly in the air, with one hand clenched in a fist. The raised fist has been used as a symbol of solidarity by many leftist groups, including the Black Power movement and the Black Panthers in the 1960s. By depicting this field worker under the massive, overpowering sun, Lewis refers to the plight of slaves and migrant workers. "Field." Now Dig This! Art in Black Los Angeles, 1960–1980 Digital Archive. Los Angeles: Hammer Museum, 2016. https://hammer.ucla.edu/now-dig-this/art/field.